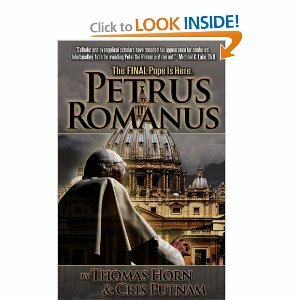 A book published last year entitled “Petrus Romanus: The Final Pope Is Here,” by authors Cris Putnam and Tom Horn, detailed the Malachy prophecy and predicted that the current Pope would abdicate for health reasons, paving the way for the final Pope. An author who predicted Pope Benedict XVI would be the first pontiff in nearly 600 years to resign believes the election today of Jorge Mario Bergoglio as the 266th Roman Catholic pontiff lines up with a medieval prophecy that would make him the “final pope” before the End Times. His book examines St. Malachy’s “Prophecy of the Popes,” said to be based on a prophetic vision of the 112 popes following Pope Celestine II, who died in 1144. Malachy’s prophecies, first published in 1595, culminate with the “final pope,” “Petrus Romanus,” or “Peter the Roman,” whose reign ends with the destruction of Rome and the judgment of Christ. Horn has said a pope of Italian descent would fulfill the prophecy, noting Bergoglio is the son of Italian parents and a Jesuit. Horn noted Thibaut is among many Catholic leaders, including popes, cardinals and priests, who have affirmed Malachy’s work, which was kept in the Vatican archives for five centuries before it was first published. He said Thibaut used a number of methods of cryptographic analysis to come up with the date 2012, including calculating the average length of papal reign up until the time he wrote his book. The symbol of the Benedictine order includes an olive branch. The founder of the Olivetans in the 14th century is a remote family member of mine, recently canonized, St Bernardo Tolomei. The Benedictine Order is not “also known as the Olivetans”–only one, and relatively small, branch of the order.